11. The Hellenistic Philosophers. 11.2. The Stoics. Steps of the Ποικίλη Στοὰ, located at the north-west corner of the Agora, the central square in Athens. 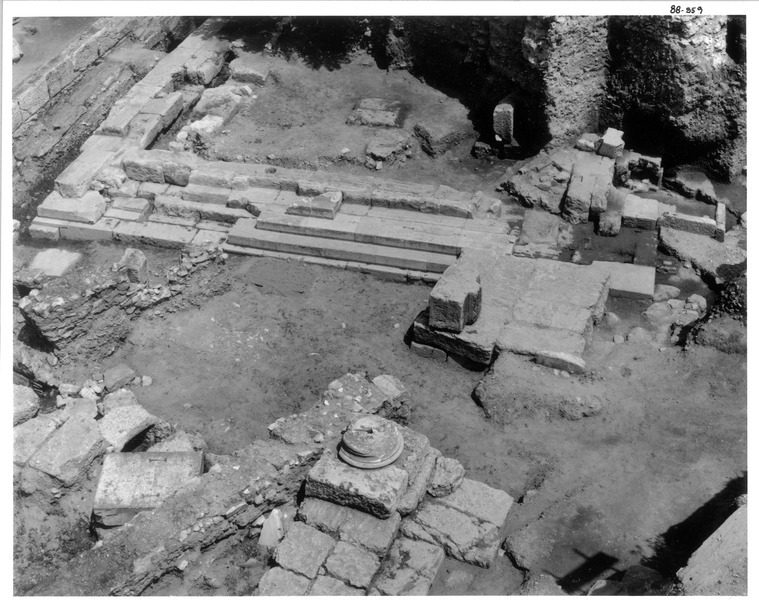 In the foreground is the foundation of the Hellenistic Gate, which allowed access to the Agora from the north. Marcus Aurelius, 121-180 CE. Roman Emperor from 161-180 CE. The Stoics (which as a school of thought divides into early, middle, and late) take their name from their initial meeting place in the Ποικίλη Στοά. A στοά is a roofed colonnade. The Ποικίλη Στοά was a particular roofed colonnade that derived its name from its murals. This process of looking back for inspiration to the classical philosophy of Plato and Aristotle seems to begin with Panaetius, who was a great admirer of Plato. Panaetius succeeded Antipater of Tarsus in about 129 BCE to become the seventh head of the Stoic school in Athens. The reasons for this loss are many, but perhaps the primary one is that Stoicism itself became less popular and by the middle of the third century CE no longer attracted practitioners. Without the school, the books went out of circulation. Further, for various reasons, it became possible to think that Stoic philosophy was a development of the philosophy of Plato and thus need not be understood on its own terms. With Stoicism viewed in this way, the Platonists (whose school was then the dominant tradition) saw no need to preserve the surviving early Stoic texts since the Platonic texts were thought of as the best indication of the true philosophy Plato had glimpsed. The Stoic texts that did survive, primarily those of the later Stoics were preserved in part because they seemed to serve a practical need consistent with the current world view. The Stoics (like the Hellenistic philosophers generally) tried to correct what they saw as mistakes in the classical tradition of Plato and Aristotle. Plato and Aristotle thought that the soul has a part with reason and a part without reason and that Socrates had wrongly overlooked the part without reason in the way he thought about human beings. The Stoics, in contrast, thought that although a human being begins life with a soul without reason, this soul ceases to exist when a human being becomes an adult. (For the Stoics, adults are humans with reason. Children and non-human animals lack reason.) The Stoics thought that Plato and Aristotle failed to realize that the soul in the child is transformed and replaced so that in the adult all motivation is in terms of reason. Marcus Tullius Cicero was a Roman orator. After Caesar was assassinated in 44 BCE, Cicero tried but was unsuccessful in opposing Antony. Cicero himself was murdered not long after, but in the last years of his life, he turned to writing philosophy. The dictatorship of Caesar had forced him out of public life, and his personal life was also in disarray. (In 46 BCE, he divorced his wife (with whom he had a marriage of convenience) and married a younger woman. This marriage ended in less than a year, in part because of his grief over the death in childbirth of his daughter.) He decided that since he was unable to serve the public through politics, he would serve through education by writing philosophy in Latin. His writing is primary source for much of the thought of the Hellenistic philosophers. "Whereas the ancients claimed the passions (perturbationes) are natural and have nothing to do with reason, and whereas they located desire in one part of the soul, and reason in another, Zeno [of Citium] would not agree with that. He thought that these commotions were equally voluntary and arose from a judgment which was a matter of mere opinion..." (Cicero, Academica I.39). The Stoics developed their theory of “impressions” (φαντασίαι), and ultimately their theory of the will, to clarify what they understood as the Socratic idea that motivation has its basis in reason because it stems from beliefs (knowledge or opinion) about what is good and what is bad. In adults, impressions are roughly what is meant in English when someone says that he has the impression that such-and-such, for example, that the color of the background on this page is a shade of white. Impressions are not restricted to ones given in the senses. Nor does the propositional content of an impression have to be have true. The person who has the impression can "assent" (συγκατάθεσις) to it. Assenting to an impression results in belief or knowledge in the propositional content of the impression. Two kinds of impressions for the Stoics play a special role in how they understanding human beings. They are "impulsive" and "cognitive" impressions. Further, they thought impressions work differently in children and animals. ⊕ "[Diocles says that the] Stoics agree to put in the forefront the doctrine of impression and sensation, inasmuch as the standard (κριτήριον) by which the truth of things is tested is generically an impression, and again the theory of assent and that of cognition (καταλήψεως) and thought, which precedes all the rest, cannot be stated apart from impression" (Diogenes Laertius, Lives of the Philosophers VII.49). Diocles of Magnesia wrote a work entitled Survey of the Philosophers (Ἐπιδρομὴ τῶν φιλοσόφων) that Diogenes Laertius excerpts. Apart from these excerpts nothing is known about him or his work. "Another division of impressions (φαντασιῶν) is into rational (λογικαί) and irrational (ἄλογοι), the former being those of rational creatures, the latter those of the irrational. Those which are rational are processes of thought (νοήσεις), while those which are irrational have no name." (Diogenes Laertius, Lives of the Philosophers VII.51). "An animal's first impulse, say the Stoics, is to self-preservation, because nature from the outset endears it to itself.... [T]hat pleasure is the object to which the first impulse of animals is directed, it is shown by the Stoics to be false. For pleasure, if it is really felt, they declare to be a by-product, which never comes until nature by itself has sought and found the means suitable to the animal's existence; it is an aftermath comparable to the condition of animals thriving and plants in full bloom. And nature, they say, regulates the life of plants too, in their case without impulse and sensation, just as also certain processes go on of a vegetative kind in us. But when in animals impulse has been superadded, whereby they are enabled to go in quest of their proper sustenance, for them, say the Stoics, the rule of nature is to follow the direction of impulse. But when reason by way of a more perfect leadership has been bestowed on the beings we call rational, for them life according to reason (λόγον) rightly becomes the life according to nature. For reason intervenes as the craftsman of impulse" (Diogenes Laertius, Lives of the Philosophers VII.85-86). "An impression (φαντασίαν) is an imprint on the soul" (Diogenes Laertius, Lives of the Philosophers VII.45) that represents the world as being a certain way. In adults, because they have reason, impressions are articulated in terms of concepts. The adult sees things as things of a sort, a shade of white as a shade of white, a human being as a human being. Animals and children lack reason. Their impressions are representations, but they are not articulated in terms of concepts. Motivation works in terms of "impulsive impressions" (φαντασίαι ὁρμητικαί), but these impressions function differently in adults and in animals and children. To understand the Stoic view of motivation, it helps to consider a model in which maintenance and achievement goals explain behavior. A maintenance goal encodes a relationship with the world that an agent tries to maintain through its behavior. When the relationship fails, the maintenance goal tends to give rise to an achievement goal. The achievement goal, in turn, tends to cause the agent to engage in behavior that will reinstate the relationship. For an example, consider hunger in animals. When animals are hungry, they tend to move to find food and eat it. In terms of the model, the conditional "if I am hungry, I find food and eat it" is instantiated in the animal so that it functions as a maintenance goal. When the animal registers the truth of the antecedent, the content of the consequent is activated as an achievement goal. This model provides a way to understand how impulsive impressions function in children and animals. The presence of the impulsive impression triggers a maintenance goal, and the maintenance goal gives the impression its impulsiveness. In the context of Stoic psychology, the maintenance goal has its basis in how nature constructs animals and children. The Stoics think that nature is provident and that nature constructs animals and children so that when they have certain impressions they naturally behave in ways conducive to their survival and well-being. The Stoics think that when a child becomes an adult, although motivation still occurs in terms of impulsive impressions, “assent” (συγκατάθεσις) becomes necessary for impressions to issue in impulses. Assent is a function of reason. Because animals and children lack reason, they cannot assent. At the same time, they do not need to assent. In them, nature in its providence arranges things so that impulsive impressions automatically issue in impulses. Adults, however, according to the Stoics, act in terms of reason. They must assent to their impulsive impressions. In the adult, the impulsiveness of an impulsive impression is a function of its relation to other states in the psychology. Only against the background of a belief (knowledge or opinion) about what is good or what is bad does assent to an impression constitutes an impulse. Animals and children naturally behave in accordance with the perfectly rational order of things in nature, but adults have reason. Their impulses are a function of their understanding of what the good is and how it applies the circumstances. In this way, beliefs about what is good and what is bad function like the maintenance goals that underwrite the impulsiveness of certain impressions in animals and children. If the adult believes it is good for him to find food and to eat it if he is hungry, then the impression "I am hungry" is impulsive for him. If he assents to this impression, then given the way nature constructs his psychology, his assent provides him with the impulse to find food. ⊕ "The criterion of truth they declare to be the cognitive impression (καταληπτικὴν φαντασίαν)..." (Diogenes Laertius, Lives of the Philosophers VII.54). Adults can assent on the basis of their beliefs (knowledge or opinion), but there is also another way for adults to assent to their impressions. Children and animals cannot have beliefs, according to the Stoics, and although adults can have beliefs, there is a point in the transition from child to adult at which no assent has been given and hence there are no beliefs. The Stoics explain assent in this situation in terms of the presence of a special kind of impression. They think that nature in its providence makes the soul of the adult so that the presence of this kind of impression automatically results in the assent. Impressions of this sort are "cognitive impressions" (φαντασίαι καταληπτικαί). The propositional content of a cognitive impression is true, but merely having a true propositional content is not enough to make an impression cognitive. A cognitive impression is an impression with a true propositional content that is formed in a certain distinctive way. "When a man is born, the Stoics say, he has the commanding-part of his soul (τὸ ἡγεμονικὸν μέρος τῆς ψυχῆς) like a sheet of paper ready for writing upon. On this he inscribes each of his conceptions (ἐννοιῶν). The first method of inscription is through the senses. For by perceiving something, e.g., white, they have a memory of it when it has departed. And when many memories of a similar kind have occurred, we then say we have experience (ἐμπειρίαν). For the plurality of similar impressions is experience. Some conceptions arise naturally in the aforesaid ways and undesignatedly, others through our own instruction and attention. The later are called 'conceptions (ἔννοιαι)' only, the former are called 'preconceptions (προλήψεων)' as well" (Pseudo-Plutarch, Placita 4.11; LS 39 E). Children do not have reason and so have the same kind of sense-impressions as animals, but unlike in animals, the sense-impressions in children give rise to certain concepts or "preconceptions" (προλήψεις) of colors, shapes, and other simple perceptual features. As human beings mature, their sense-impressions give rise to these simple concepts. More complex concepts arise naturally from these simple concepts. In this way, human beings naturally develop so that they have cognitive impressions that give them "cognitions" (καταλήψεις) of things. This is how nature in its providence ensures that human beings can properly orient themselves in the world. This understanding of reason shows itself in Aristotle's theory of induction in the Prior Analytics and the Metaphysics and ultimately to has its roots in Plato's Theory of Recollection. "Reason (λόγος), for which we are called rational (λογικοί), is said to be completed from our preconceptions (προλήψεων) during our first seven years" (Pseudo-Plutarch, Placita 4.11). Having reason for the Stoics is a matter of having preconceptions and the basic truths about the world that these conceptions embody. The preconceptions form the basis for the recognition of consequence and incompatibility and thus for the ability to make inferences. Given, say, a preconception of a human being, the adult is in a position to make various inferences. Because it is part of the notion of a human being that there is a relation of consequence between being human and being mortal, the adult can infer of the human beings he sees that they are mortal. "But what is more divine, I will not say in man only, but in all heaven and earth, than reason? And reason, when it is full grown and perfected, is rightly called wisdom" (Cicero, On the laws I.7; cf. 22). This perfection is a matter of grasping the truths embodied in preconceptions in such a way that they provide a basis for the life nature has arranged for human beings to live. "[A cognitive impression] being plainly evident (ἐναργὴς) and striking, lays hold of us, almost by the very hair, as they say, and drags us off to assent (συγκατάθεσιν), needing nothing else to help it to be thus impressive or to suggest its superiority over all others. For this reason, too, every man, when he is anxious to apprehend (καταλαμβάνεσθαι) any object exactly, appears of himself to pursue after an impression of this kind—as, for instance, in the case of visible things, when he receives a dim impression of the real object. For he intensifies his gaze and draws close to the object of sight so as not to go wholly astray, and rubs his eyes and in general uses every means until he can receive a clear and striking impression of the thing under inspection, as though he considered that the credibility of the apprehension (τὴν τῆς καταλήψεως πίστιν) depended upon that" (Sextus Empiricus, Against the Logicians I.257-258; cf. Cicero, Academica II.38). "[A]ccording to the Stoics the cognitive impression (καταληπτικὴ φαντασία) is judged to be cognitive by the fact that it proceeds from an existing object and in such a way as to bear the impress and stamp of that existing object; and the existing object is approved as existent because of its exciting a cognitive impression" (Sextus Empiricus, Against the Ethicists 183). "An impression (φαντασίαν) is an imprint on the soul: the name having been appropriately borrowed from the imprint made by the seal upon the wax. Of impressions, some are cognitive (καταληπτικήν) and some are not-cognitive (ἀκατάληπτον). The former, which they say is the criterion (κριτήριον) of reality, is defined as that which proceeds from a real object, agrees with that object itself, and has been imprinted seal-fashion and stamped upon the mind: the latter, or non-cognitive, that which does not proceed from any real object, or, if it does, fails to agree with the reality itself, not being clear or distinct (μὴ τρανῆ μηδὲ ἔκτυπον)" (Diogenes Laertius, Lives of Eminent Philosophers VII.1.45-46). Nature in its providence arranges things so that human beings can acquire the knowledge they need, and cognitive impressions are part of this arrangement. In the course of their ordinary interactions with the world, human beings have impressions that are cognitive. They must form their impressions under the appropriate conditions. They cannot can not do so when they are sick or at other times in which their minds are not working normally, and they must perceive the objects under the conditions that are appropriate for the sensory organs. So, for example, to determine by looking whether something is a human being, there must sufficient light to make the determination. Under these conditions, human beings have cognitive impressions. Being cognitive is an objective feature of the impression. The impression "bear[s] the impress and stamp" of reality in a certain way. It has a certain "clarity" and "distinctness," and nature in its providence has arranged things so that the propositional content of a impression with this character is true. It is not completely clear just how the Stoics understood this "clarity" and "distinctness," but the suggestion seems to be that as part of how nature in its providence arranges things so that human beings can orient themselves in the world, the things human beings need to know about to live good lives have a set of features that makes them distinct from all other objects. A cognitive impression represents these features with a "clarity" that causes one to assent to the impression and thus to form a true belief. Human beings do not have the ability to distinguish every true impression from every false impression, but they can distinguish cognitive impressions from non-cognitive impressions and thus can have the knowledge they need to live good lives. "Knowledge (ἐπιστήμην) they [the Stoics] say is steadfast cognition (κατάληψιν ἀσφαλῆ) or a state which in reception of impressions cannot be shaken by argument. Without the study of dialectic, they say, the wise man cannot guard himself in argument so as never to fall" (Diogenes Laertius, Lives of the Philosophers VII.47). The Stoics hold that cognitive impressions provide the basis for what they understand as "knowledge." Assent to a cognitive impression issues the propositional attitude that they call "cognition" (κατάληψις). All cognitions are true, but not all cognitions are knowledge. For the Stoics, "knowledge" is the propositional attitude formed in assent that no rational means can force one to withdraw. They thought that this was the lesson of Socrates. As they understood him, although he thought knowledge was possible, he thought that no one has knowledge because no one can see his way through his questioning. He always forces his interlocutors to withdraw their assent. Only the wise have knowledge. The rest have "opinions" (δόξαι). "Zeno ascribed reliability not to all impressions, but only to those which manifest, in a certain particular way, those objects which make the impressions. Such an impression, when it is perceived in itself, he called graspable... for how else could you express καταληπτόν. But when it is already received and accepted, he called it a grasp, resembling objects gripped in the hand, and in fact he had derived the actual term from manual prehension, nobody before having used the word in such a sense..." (Cicero, Academica I.41). "Zeno [of Citium] would spread out the fingers of one hand and display its open palm, saying 'An impression is like this.' Next he clenched his fingers a little and said, 'Assent is like this.' Then, pressing his fingers quite together, he made a fist, and said that this was cognition (and from this illustration he gave that mental state the name of κατάληψιν, which it had not before). Then he brought his left hand against his right fist and gripped it tightly and forcefully, and said that knowledge was like this and possessed by none except the wise man-but who is a wise man or ever has been even they themselves do not usually say" (Cicero, Academica II.145). ⊕ "[The] argument [against the Stoics] is constructed as follows: 'Some impressions are true, others false; and what is false cannot be perceived. But a true impression is invariably of such a sort that a false impression also could be of exactly the same sort; and among presentations of such a sort that there is no difference between them, it cannot occur that some are capable of being perceived and others are not. Therefore there is no impression that is capable of being perceived" (Cicero, Academica II.40-41). The English word 'perception' derives from Cicero's use of perceptio for κατάληψις ("cognition" or, literally, "grasp"). The Latin perceptio means "a taking, receiving; a gathering in, collecting." So although Cicero sometimes uses perceptio for κατάληψις, he does not mean to suggest that the Stoics thought that cognitive impressions are the form sense impressions take in adults. Arcesilaus and the Academics (who are the subject of the next lecture) questioned the Stoics and argued that they were committed to the view that it is necessary to withhold assent. The identity of indiscernibles is the view that if x and y are indiscernible, then x is y. The indiscernibility of identicals is the view that if x is y, then x and y are indiscernible. The indiscernibility of identicals is thought to be a truth of logic. The identity of indiscernibles is more controversial. The Academics also took themselves to be following Socrates, but they took him to show that knowledge is not possible for human beings. They tried to use the sort of questioning Socrates uses to get the Stoics to agree that for every true impression, it is possible that there is another just like it that is false. It follows, in this case, that there are no cognitive impressions. 3. If no impression is cognitive, then it is necessary withhold assent. In response to this questioning, the Stoics did not agree that for every true impression there could be another like it that is false. According to the Stoics, indiscernibles are identical. ⊕ "Zeno was the first (in his treatise On the Nature of Man) to designate as the end 'life in agreement (ὁμολογουμένως) with nature' (or 'living agreeably to nature'), which is the same as a life according to virtue, virtue being the goal towards which nature guides us. ... And this is why the end may be defined as life in accordance with nature, or, in other words, in accordance with our own human nature as well as that of the universe, a life in which we refrain from every action forbidden by the law common to all things, that is to say, the right reason which pervades all things, and is identical with this Zeus, lord and ruler of all that is. And this very thing constitutes the virtue of the happy man and the smooth current of life, (τὴν τοῦ εὐδαίμονος ἀρετὴν καὶ εὔροιαν βίου) when all actions promote the harmony of the destiny (δαίμονος) dwelling in the individual man with the will (βούλησιν) of him who orders the universe" (Diogenes Laertius, Lives of the Philosophers VII.87-88). On the good life and happiness, the Stoics developed the view they thought Socrates held. They hold that the good life is a matter of having virtue, that having virtue is having a certain wisdom, and that this wisdom includes knowledge of what is good and what is bad. The Stoics think that human beings acquire reason as they mature, that knowledge of what the good is is part of reason, and that the actions of adult are completely a matter of reason. In this way, the Stoics suppose that nature in its providence constructs human beings so that they get a set of cognitions adequate for understanding of certain aspects of the world. They need this understanding to orient themselves properly and thus be in a position to have the knowledge to live good lives. The Stoics identify nature with fate and think of it as a perfectly rational agent that arranges things in the world. They think that nature arranges things so that human beings develop a preconception of the good, but that human beings almost always misapply this knowledge. The Stoics think that when human beings transform from children to adults and thereby acquire reason, they form false beliefs about what is good and what is bad. They come to think what human beings ordinarily think about what is good and what is bad, that health is good, sickness is bad, and so on. By reflecting on their behavior in a certain way, human beings realize that the good applies to nature and that they should "live in agreement with nature." The Stoic sage understands that nature is perfectly rational, that human beings have a part to play in maintaining the perfect rationality in nature, and that they play this part by acting rationally. The sage understands that the good does not apply to the world insofar as he eats when he is hungry, regains his health when he is sick, and so on, but instead applies to the world because nature is perfectly rationally. He does not know what will happen in every situation. He is not omniscient, but he knows that the order in nature is in general one in which human beings eat when they are hungry, recover when they are ill, and so on. This sets him apart from the Stoic fool whose impulses are excessive because he (like human beings generally) thinks that it is bad not to find food when he is hungry, not to regain his health when he is ill, and so on. The sage, because he "lives in agreement with nature," has a life that is good and is filled with a joy that vastly surpasses the pleasure in any other life. In this way, the Stoics return to a more Socratic conception of the good life. The good life is not a life of "contemplation" (θεωρία), as it is for Plato and Aristotle. The Stoic sage does the same sort of things in his life that human beings do in life ordinarily. The difference is in his motivation. He is not confused about what is good and what is bad. He does not attribute a value to health, life, and other ordinary "goods" that they do not possess. It is reasonable for him, given his partial understanding of the order in nature, to try to arrange things so that he is healthy and maintains his life, but he is not upset despite his precautions if he falls ill and does not recover. He realizes that his not recovering in these circumstances is part of the perfectly rational order in nature. ἀπάθεια, apatheia, noun, (ἀ "not" +‎ πάθος, noun, páthos, "passion"), "without passion,"
"[The ruler in the just city] makes the least lament and bears it most mildly when any such misfortune overtakes him" (Republic III.387e). The Platonic ideal is μετριοπάθεια, not ἀπάθεια. ἐναργής , enargēs, adjective, "visible, palpable,"
ἔννοια, ennoia, noun, "notion, conception,"
εὐπάθεια, eupatheia, noun, "comfort, ease,"
καταλαμβάνω, katalambanō, verb, "seize with the mind, comprehend,"
καταληπτός, katalēptos, adjective, "capable of being seized,"
comprehendo, verb, to take, catch hold of, seize, grasp, apprehend, comprehend,"
comprehensibilis (also -dibilis), adjective, "that can be seized or laid hold of, comprehendible,"
Cicero uses comprehendibilis for καταληπτός. "'...[Zeno] termed 'graspable' (comprendibile)—will you endure these coinages?' 'Indeed we will,' said Atticus, 'for how else could you express καταληπτόν'" (Academica I.41). perceptio, noun, "a taking, receiving, a gathering in, collecting,"
percipio, verb, "to take possession of, to seize, occupy,"
perturbatio, noun, "confusion, disorder, disturbance,"
ratio, noun, "a reckoning, account, calculation, computation,"
visum, noun, "appearance, impression, presentation,"
"[Zeno] made some new pronouncements about sensation itself, which he held to be a combination of a sort of impact offered from outside (which he called φαντασίαν and we may call a presentation (visum)..." (Cicero, Academica I.40). "The Stoics revert to Socrates' extreme intellectualism. They deny an irrational part of the soul. The soul is a mind or reason. Its contents are impressions or thoughts, to which the mind gives assent or prefers to give assent. In giving assent to an impression, we espouse a belief. Desires are just beliefs of a certain kind, the product of our assent to a so-called impulsive impression" (Michael Frede, "The Philosopher," 10. Greek thought: A Guide to Classical Knowledge, edited by J. Brunschwig and G.E.R. Lloyd (Cambridge University Press, 2000), 3-16). "[T]he distinctive mark of cognitive impressions is a causal feature in that it makes the mind react in a distinctive way and it is in this sense that the mind can discriminate cognitive and noncognitive impressions. ... But this is not to say that we cannot be aware of the fact that an impression is cognitive or noncognitive, that we cannot learn to tell whether an impression is clear and distinct or obscure and confused. In fact, the Stoic view seems to be that this is a matter of practice and that in principle one can get so good at it that one will never take a noncognitive impression to be cognitive" (Michael Frede, "Stoics and Skeptics on Clear and Distinct Impressions," 168, 169. Essays in Ancient Philosophy, Michael Frede (University of Minnesota Press, 1987), 201-222). "[The question is] precisely how reason thus conceived [as consisting of natural notions and the knowledge they embody] gives rise to reasoning and inference. Galen in various places attributes to reason as a basic feature the ability to recognise consequence (akolouthis) and incompatibility (mache). These notions play a prominent role in Stoic thought. And it is tempting to think that the idea that it is a characteristic of reason to recognise consequence an incompatibility is of Stoic origin. If we make this assumption, the following account suggests itself. To have the notion, say, of a human being is to see that a relation of consequence or implication obtains between being a human being and being mortal; it also is to see that a relation of incompatibility obtains between being a human being and being devoid of reason. Thus the ability to recognise consequence and incompatibility is part of what it is to have natural concepts or, for that matter, any kind of concepts. But by having concepts, and thus being able to recognise consequence and incompatibility, we also are in a position to reason to make inferences" (Michael Frede "The Stoic Conception of Reason," 55. Hellenistic Philosophy. Volume II, edited by K.J. Boudouris (Athens, 1994), 50-63). "[T]he Stoic sage does not gain his equanimity by shedding human concerns, but by coming to realise what these concerns are meant to be, and hence what they ought to be, namely the means by which nature maintains its natural, rational order. And we have to realize that in this order our concerns play a very, very subordinate role, and are easily overridden by more important considerations, though we may find it difficult to accept this. But it does not follow from the fact that they play a very subordinate role, that they play no role whatsoever. Nature is provident down to the smallest detail. Hence it must be a caricature of the wise man to think that he has become insensitive to human concerns and only thus manages to achieve his equanimity. Things do move him, but not in such a way as to disturb his balanced judgment and make him attribute an importance to them which they do not have" (Michael Frede, "The Stoic Affections of the Soul," 110. The Norms of Nature: Studies in Hellenistic Ethics, edited by M. Schofield and G. Striker (University of Cambridge Press, 1986), 93-110). "Claims sometimes made to the contrary notwithstanding, even the Stoic sage is not omniscient. He disposes of a general body of knowledge in virtue of which he has a general understanding of the world. But this knowledge does not put him into a position to know what he is supposed to do in a concrete situation. It does not even allow him to know all the facts which are relevant to a decision in a particular situation. He, for instance, does not know whether the ship he considers embarking will reach its destination. The Stoic emphasis on intention, as opposed to the outcome or the consequences of an action, in part is due to the assumption that the outcome, as opposed to the intention, is a matter of fate and hence not only not, or at least not completely, under our control, but also, as a rule, unknown to us. Therefore, even the perfect rationality of the sage is a rationality which relies on experience and conjecture, and involves following what is reasonable or probable. It is crucially a perfect rationality under partial ignorance" (Michael Frede, "Introduction," 16-17. Rationality in Greek Thought, edited by Michael Frede and Gisela Striker (Oxford University Press, 1996), 1-28). "God constructs them in such a way that they can recognize for themselves what they need to do to maintain themselves (as long as they themselves are needed) and hence will maintain themselves of their own choice and understanding. He constructs them in such a way that they develop reason, and with reason an understanding of the good, and thus come to be motivated to do of their own accord what needs to be done. So, instead of constructing them in such a way that they are made to do what they need to do to maintain themselves, he constructs them in such a way that they do this of their own initiative and indeed can do it wisely, showing precisely the kind of wisdom, ingenuity, resourcefulness, and creativity on a small scale, namely, the scale of their life, which God displays on a large scale. In this way, if they are wise, human beings genuinely contribute to the optimal order of the world, and they find their fulfillment in this. This is what the good life for the Stoics amounts to" (Michael Frede, A Free Will. Origins of the Notion in Ancient Thought (edited by A. A. Long, with a foreward by David Sedley), 73-74. University of California Press, 2011).